Videogaming’s rapid shift from a living-room hobby to a spectator sport is luring mainstream advertisers and intensifying competition between big game publishers and nimble upstarts. The earliest videogame contests are nearly as old as videogames themselves. 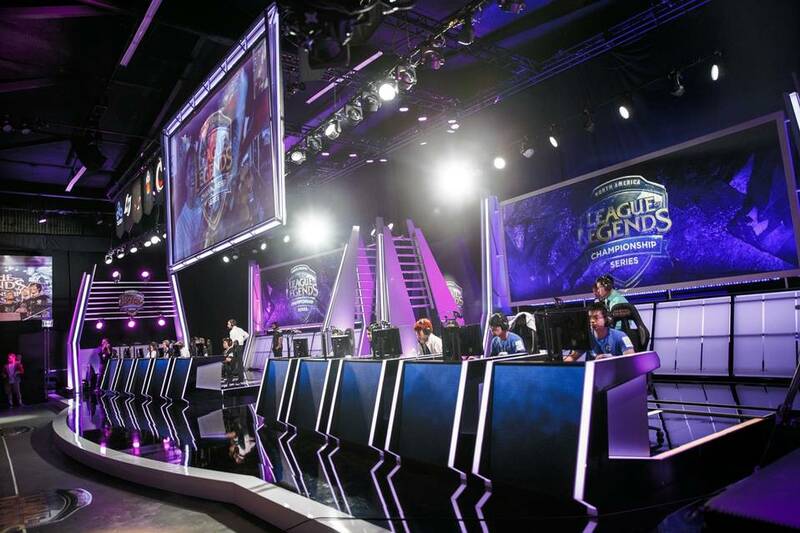 But the combination of team-based games and live-streaming video in the past five years has given rise to tournaments watched by millions of people online and in arenas around the world. Marketers typically attached to U.S. sports leagues have noticed. Arby’s Restaurant Group Inc. will be one of three initial sponsors when Time Warner Inc.’s TBS begins broadcasting videogame competitions on Friday. The restaurant chain expects to spend roughly $5 million this year on “e-sports” and other videogame-related marketing. “This is where the future is,” said Rob Lynch, Arby’s marketing chief. Anheuser-Busch InBev NV plans to promote its Bud Light brand at tournaments this year. Berkshire hathaway Inc.’s Geico unit sponsors two pro teams and expects to organize a half-dozen competitions this year. Not everyone is sold on e-sports for television. TBS is still talking to companies to fill five remaining sponsorships, a Turner spokeswoman said. Some companies worry that television play is untested. Pizza Hut, a unit of Yum Brands Inc., plans to spend roughly $1 million on e-sports marketing this year, but only online and onsite at competitions. Executives such as Mr. Ruhland, though, see the potential to reach a younger audience. “It is a renaissance moment for e-sports,” he said. 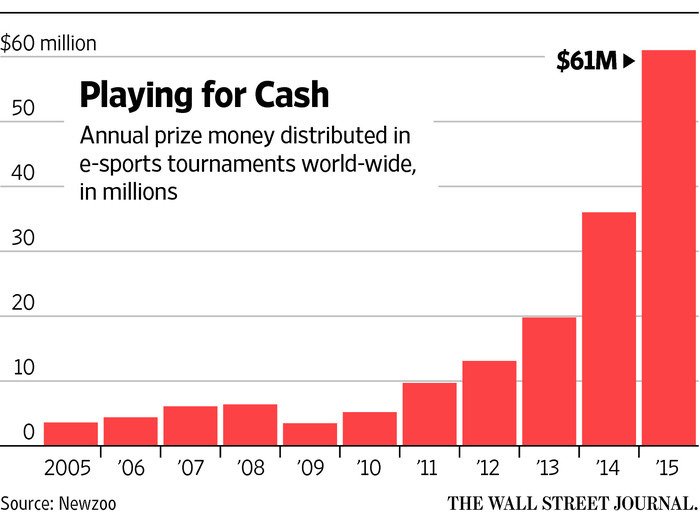 E-sports is a small sliver of the $100 billion videogame industry. Like in other sporting events, athletes in the digital arena sport high-end gaming gear and jerseys with sponsor logos. Revenue from ticket and merchandise sales, advertising and other areas is expected to more than double to $1.07 billion by 2019, according to Newzoo. In addition to drawing on advertising budgets, the niche’s growth could shift how gamers spend money. Rather than buying multiple games, some players are focusing on just one or two to hone skills and upgrade digital gear, much the way enthusiasts try to improve at golf or tennis. Such devotion raises the stakes for publishers such as Electronic Arts Inc. and Activision Blizzard Inc., which make bank on big franchises such as “Call of Duty” and “Madden NFL” but have watched casual mobile games and now competitive gaming eat up players’ time and cash. “Our dream is that five years from now, ‘Vainglory’ will be the biggest e-sport,” operating chief Kristian Segerstrale said. EA and Activision Blizzard are determined to stay ahead of the sea change after watching young rivals such as “Clash of Clans” maker Supercell Oy grab much of the lucrative market in mobile gaming’s rise. The companies, which own popular e-sports titles already, agree the more entrenched gamers are in a franchise, the more money they will spend. Activision Blizzard last year purchased Major League Gaming, an e-sports broadcaster, and hired executives with NFL Network and ESPN experience to run a new e-sports division. At the NewFronts digital-media conference earlier in May, Activision Blizzard announced a partnership with Facebook Inc. under which it plans to publish live broadcasts to the site daily. Chief Executive Bobby Kotick likens e-sports to traditional sports—a seemingly apt comparison given that baseball’s Alex Rodriguez and basketball’s Shaquille O'Neal hold stakes in a Los Angeles-based e-sports team called NRG. Legislators in Nevada are even discussing how to legalize betting on the outcome of videogame competitions. EA is re-crafting core franchises such as “Madden NFL” to appeal to e-sports enthusiasts. It is adding up-to-the-minute scores and rethinking how to pit experienced gamers against newbies in online contests, for example.